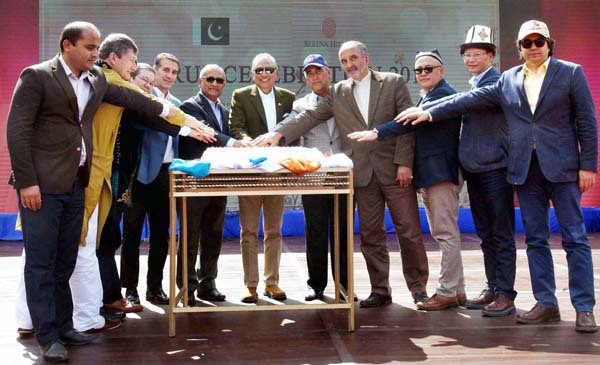 ISLAMABAD, Mar 24 (APP):President Dr Arif Alvi Sunday urged the people to establish their persistent connection with the nature to tackle the challenges of global warming else the autumn would take on them. Addressing a colorful Nowruz festival arranged by nine diplomatic mission in Pakistan, the United Nations and Serena Hotels to mark the onset of spring and beginning of the New Persian Year, the president said the nature showed all of its splendors but the humans ignored and took it for granted. The president wished the audience Happy Nowruz to the participants attending the cross cultural event that marked cultural performances of all the participating countries including Uzbekistan, Turkmenistan, Pakistan, Tajikistan, Kazakhstan, Azerbaijan, Afghanistan, Kyrgyzstan, Iran and Turkey. All the countries had set up their stalls exhibiting their cultural artifacts, cuisine and dresses where the attendants wore their colorful cultural dresses and served the guests with their traditional dishes. The participants were specially served with ‘smanak’, a traditional sweet dish made purely from germinated wheat, milk and water and specially and prepared especially for Nowruz festival. The president, who also cut the celebratory cake to formally launch the festival and visited all the stalls, said the festival showed flowers and the children who exhibited their varying cultures through their performances gave the message of hope. He said the Nowruz was a beauty which replenished and rejuvenated the people but asked why the man separated himself from the nature. He said the Central Asian states gave a message of peace and said a bright future awaited the Central Asia. He said Pakistan had also thrown away the chains of terrorism and extremism and had embarked upon a journey of development. He said the neighboring and other friendly countries were also looking for peace in the region. He said during its war against terrorism, what Pakistan had learnt was important. He reiterated his call for efforts against Islamophobia and xenophobia. In his address, Dean of Diplomatic Corps and Ambassador of Turkmenistan Atajan Movlamov said Nowruz had been enlisted among the Unesco’s list of Intangible Cultural Heritage. He said the festival was celebrated by over 300 million people across the world which brought people together to give a message of peace and love. UN Resident Coordinator Neil Buhne read out the message from the UN Secretary General who said the festival promoted a spirit of friendship and harmony. He wished that the festival to become an inspiration for all. CEO Serena Hotel Aziz Bolani said this was a unique occasion when all the participating countries were in festive mood. He said Serena Hotel always took lead in community initiatives including art and sports.